The stories which follow in this chapter are just one more example of what happens when outsiders interfere in the affairs of an indigenous population. The Agikuyu an ancient Northern BaNtu Kenya tribe had never been successfully invaded, not even by the Arabic slave traders. It therefore follows that they were bold and skilled in defence and arts of war. 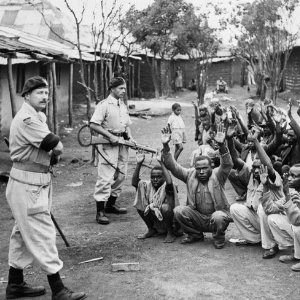 When Britain colonised Kenya and put them under the yoke, the kick back was just a matter of time. This is a story of the terrifying Mau Mau uprising in Kenya and is demonstrative of the changing attitude of African indigene towards European subjugation all across Africa at that time.